On your first visit to Tavistock or Lamerton Physiotherapy Clinics, you will be asked to fill out a short form detailing any relevant health issues. Your Physiotherapist will then call you into a treatment room and continue to ask you some further questions whilst filling out a computerised assessment form. The Physiotherapist will then assess your posture and analyse the movement of the problem area of your body. Occasionally, you will be asked to remove an item of clothing to allow the Physiotherapist to analyse your movement or to palpate your problem area. You are welcome to bring anyone you wish to accompany you. Your assessment will also involve some treatment, which may include joint manipulation, mobilisation, soft tissue or myofascial massage, acupuncture, electrotherapy (ultrasound) plus advice re the best way to care for your specific problem area. The initial assessment will take approximately one hour, subsequent treatment sessions usually take up to 30 minutes. However, if your problem is complicated, you may require an hour on subsequent sessions too. You may wish to bring a pair of shorts or a vest top, if appropriate for the area to be treated. "I have had pain for a number of years. Will physiotherapy still be helpful for me?" Yes definitely! Our specialised physiotherapists have fantastic knowledge and interest in chronic pain (pain over 6 months in duration). Our physiotherapists can help you to live your life to the fullest. 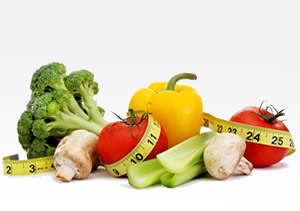 You will be at the centre of the treatment with your goals and needs taking priority. When pain has become a part of your life, it is easy to get stuck in a vicious cycle and sometimes we need a little nudge in the right direction to see the way out. "I have pain in my back or neck. How will physiotherapy help me?" The spine is made up of 33 bones (vertebra) that are stacked on top of each other to form a column. There is a disc between each bone to allow for movement and stability. The bones are linked to each other by facet joints. Ligaments and muscles attached to the spine also provide stability and movement. Nerves from the spinal column, branch out at each level. Pain in the spine may appear to occur for no obvious reason; it may come on gradually or suddenly. Most pain will settle within a few days, however, problems that continue or recur may need a specialist physiotherapy assessment to identify the cause and prevent long-term problems. At Lamerton and Tavistock Physiotherapy clinics, we have a our own Studio where we offer Pilates type exercise for neck and back care (including specific horse riding pilates), Happy Joint classes, for those who have had or are thinking of Hip and Knee joint replacement. "Do I need an Ergonomic or DSE assessment?" Work related aches and pains can affect anyone, from heavy manual to office duties. The effective management of work related injuries is based on the edict that prevention is better than cure. Prevention tactics utilise the strategic application of ‘ergonomics’ within the work place in order to design the working environment to match the capabilities of the worker and reduce the risk of injury. It is never possible to completely eliminate injury risk and if symptoms of musculoskeletal injury do start to appear, subsequent management is determined by the nature of the onset. Have you had an effective Display Screen Equipment assessment? Have you had a risk analysis of the tasks you perform? At the end of the week are you aware of aches or stiffness from your work? As an employer, do you have areas of work where employees appear to have more musculoskeletal concerns? If the answer to any of these questions is YES; contact us to discuss your needs. "My joints feel stiff and achy. Could physiotherapy help this?" Injuries may occur over time due to an underlying problem or through a specific incident. After an injury the joint needs to be restored to full function to prevent further problems. Pain may often be minimal before full recovery but problems may recur if movement is still limited or the soft tissues around the joint remain weakened or tight. A full physiotherapy assessment will identify any concerns. 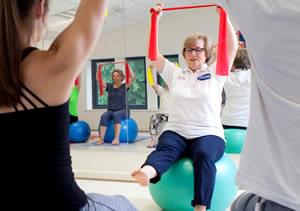 At Lamerton and Tavistock Physiotherapy clinics, we have our own Studio where we offer Happy Joint classes, for those who have had, or are thinking of Hip and Knee joint replacement, also those in need of weight management advice. Cartilage: The bones are covered with cartilage which is wear-resistant. Cartilage helps reduce the friction of movement. Synovial membrane: This lines the joint and seals it into a joint capsule. The synovial membrane secretes synovial fluid (a clear, sticky fluid) around the joint to lubricate it. Ligaments: These are tough, elastic bands of connective tissue around the joint to give support and limit the joint's movement. Tendons: These connect muscles to bones and can attach near to joints. * Bursas: These are fluid-filled sacs which are present in some joints to help cushion the friction in a joint. Meniscus: A curved piece of cartilage in the knees and other joints, acts as a shock absorbing cushion and improves the stability of the joint. "I'm not sure if I have a sprain or a strain." The nature of the sports injury varies greatly depending on the nature of the sport and the build of the sports person. Some can be from a specific injury or incident, others through over-use, whilst others may result from poor training methods. The resulting damage may be very slight and allow the person to be back to full sporting activities fairly quickly. For this type of injury, some forms of self help may be sufficient to regain full recovery. Others unfortunately, may be more serious where in order to minimise further damage and allow a quicker return to the sport, professional help should be sought through a Chartered Physiotherapist. "I think I have pulled a muscle"
Muscles are the soft tissue structures that control movement. Each muscle is composed of muscle fibres which can contract or stretch. Some muscles are large, such as the quadriceps at the front of the thigh, whilst others are much smaller such as the muscles of the hand. The longer the fleshy part of the muscle, the greater the range of its movements. They are attached to the bone via tendons; this part is for stability rather than movement and is not so elastic. The area where the tendon joins the muscle fibres is known as the musculotendinous junction. "I think I may have a whiplash associated disorder, when should I see a physiotherapist?" The neck is the main area of concern following a road traffic injury, although other areas of the body may be affected. A whiplash injury is usually one where the neck is thrown rapidly forward and back, against the head rest. This may cause injury to the soft tissues, the small joints of the neck and spasm in the surrounding muscles. Unfortunately, there is no one specific injury and each incident may be different, making general advice difficult. In the majority of accidents, there is no lasting damage, despite the adverts we see on TV. The latest evidence shows that it is better to remain as active as possible, the days of using a collar and bed rest are over! 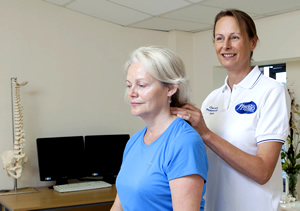 If pain continues or gets worse, early advice and treatment from a Chartered Physiotherapist to ensure that the right exercises and advice are given, will prevent the chance of long term neck problems. "I’ve had headaches or migraines for years. Could physiotherapy help?" 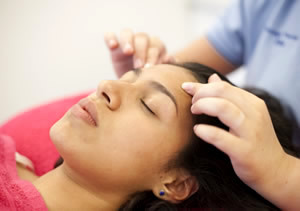 The first step in treating headache disorders MUST be proper diagnosis. Reported symptoms alone are often not conclusive and must be supported by a comprehensive physical and medical history with diagnostic tests. It is essential to rule out other possible causes of headaches. "What exercises should I do before and after surgery?" It is vital that the patient is assessed individually to understand their needs and provide the right rehabilitation programme. We will keep in communication with the surgeon to ensure optimal care. We have an exercise studio at Lamerton Physiotherapy Clinic where we run weekly “Happy Joints Classes” for people before and after surgery. Contact us for further details.